This enhanced-color image shows sand dunes trapped in an impact crater in Noachis Terra, Mars. Dunes and sand ripples of various shapes and sizes display the natural beauty created by physical processes. The area covered in the image is about six-tenths of a mile (1 kilometer) across. Sand dunes are among the most widespread wind-formed features on Mars. Their distribution and shapes are affected by changes in wind direction and wind strength. The image by the High Resolution Imaging Science Experiment (HiRISE) camera on Mars Reconnaissance Orbiter (MRO) was taken on Nov. 29, 2011. Mars may be a harsh and dusty world, but the Red Planet also doubles as a vast canvas for artful Martian winds, a newly released NASA photo reveals. The photo, snapped by NASA's powerful Mars Reconnaissance Orbiter, shows a stunning view of sand ripples and dunes inside a large impact crater in the an area of southern Mars that scientists call the Noachis Terra. Astronomers study how sand dunes erode and shift across the Martian landscape to determine the sedimentary history of the regions photographed by the MRO spacecraft. But occasionally, photos from the Mars orbiter offer more than just science, NASA officials said. "Some images of star Martian landscapes provide visual appeal beyond their science value," NASA officials said in a Jan. 25 update accompanying the new image. While the image was released on Jan. 25, it was actually taken by the MRO spacecraft on Nov. 29, 2011, they added. The new photo was taken by High Resolution Imaging Science Experiment camera aboard MRO. The orbiter has been studying Mars since it arrived in orbit around the Red Planet in 2006. 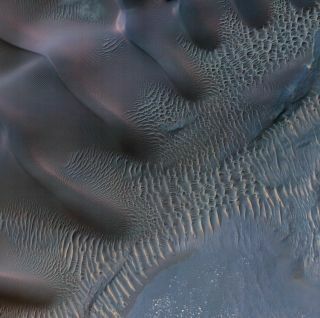 According scientists Alfred McEwen and Ginny Gulick, both of the University of Arizona where MRO's HiRISE camera science team is based, sand dunes are among the most common wind-formed features on Mars. "Patterns of dune erosion and deposition provide insight into the sedimentary history of the surrounding terrain," McEwen and Gulick wrote in a photo description. "This image shows sand dunes trapped in an impact crater in Noachis Terra. Dunes and sand ripples of various shapes and sizes … show the natural beauty created by physical processes."